The Schola of St Joseph’s choir’s offshoot, The Gregorians, is a group that was set up in January 2016, when the main choir were off duty for a month. Since some of the choir wanted to carry on singing, we decided to meet and learn a few things we never have time for. A certain conversation during our first evening’s practice changed the direction of the little group towards the Chant, which some of us appreciated is in danger of being lost in this generation. 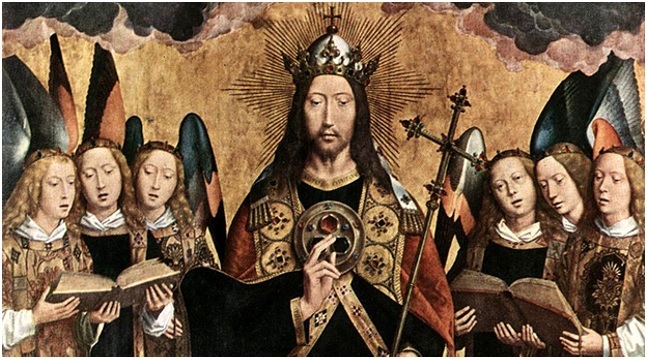 We knew that the general ignorance and regular use of Gregorian Chant and the Latin Liturgy had come about as the result of a great general misunderstanding of the real intentions of Vatican II. Amongst our number was a lady who had left school at 14, never learnt to read music, had never sung in a choir. She jumped in willingly, like a curious child, at the deep end of Gregorian notation, and we never looked back. Slowly, we are learning the great pieces of the liturgical year. We often meet at my home, so we can sup and talk afterwards. In summer we have sung in the garden, and also asked permission to sing in the various beautiful different churches around the island, not just confining ourselves to St Joseph’s. This summer two of the Gregorian Group went in June to Alderney with Fr Paul to sing 3 Gregorian Masses one long weekend. The response on Alderney was positive, and we gave an impromptu Gregorian class to the organist’s father, who himself was keen to start an Alderney Gregorian group. [His daughter needed no such class, reading the Gregorian hymns faultlessly at sight]. Fr Paul related to us how on Alderney at Easter this year, devoid of a choir, or organist, the congregation had requested of him a number of traditional liturgical things, including that he chant the great Exultet of Easter Saturday, the declaration of the triumph of Christ’s Resurrection. When he asked his congregation whether they wished him to sing it in English, as is customarily done, he was met with a resounding and unanimous, “No, in Latin”. In July, we had a holiday base on Alderney for a fortnight and both our Schola choirmaster, Luke O’Donnell, and a number of the Gregorians, as well as a visiting Dominican Sister, came and went and sung some half dozen Gregorian Masses and hymns there. The response was once again really appreciative, with even a number of holidaymakers coming up after Mass to say how much the old liturgy means to them still, and how grateful and pleasantly surprised they were to find it still alive and loved. A visiting doctor and organist offered to join us next year, to sing, not play, for Chant is not usually accompanied. Gregorian chant can reach all ages, as well as other denominations. Lasts summer the Gregorian group went to Blanchelande to teach some of the youngest children the Gregorian De Angelis Mass. The children took to it like ducks to water. They did not bat an eyelid about the Latin. It was something else new and interesting and to be explored. Several parents present commented with appreciation afterwards. Children do not have a problem with new things, or with new old things like Latin and Gregorian Chant. If there is a problem, that is in the mind of the adults who sometimes underestimate what children are capable of. However, if one does not teach this to the young, then we are in danger of having this great heritage lost forever. On pilgrimage in Lourdes this year, where at Fr Paul’s request, in Kapellmeister Luke’s absence, I was the flaky cantor, I sang only Latin and Gregorian at our daily De Angelis Mass. The youngsters, Delancians, and older pilgrims present all kindly thanked me at the end, saying how beautiful these hymns are, how they permitted them to concentrate more deeply in inner prayer, and how they made the daily Masses extra special. In addition, Fr Paul taught those of the Pilgrims who did not already know it -most of us did- the De Angelis Mass. This was sung daily with great gusto by all. In the afternoons in Lourdes we went to Adoration of the Eucharist in the Basilica. In the evenings we went to the awe inspiring torchlight processions. It was normal at all times for the multitude to sing or chant the Credo, Pater Noster, Salve Regina, Ave Maria and countless age old wonderful, traditional Latin prayers, which united us all in spirit and faith across diverse racial barriers. You could feel physically how much love and joy went into these shared, chanted and well remembered sung liturgical prayers. It was profoundly moving and up-lifting. The local pilgrims were, in some senses, a motley crew, from very different backgrounds, but we got on very well indeed, and were very sorry to part, but now have made some lasting, good friends. Music, great Church traditional music, including Gregorian chant, was no small part of this bond. “…But if I travell in your companie, You know the way to Heaven’s doore”. Herbert, Church Musicke. Please do consider joining us! We usually meet on a Monday evening at 7pm, sometimes 6.30, either in St Joseph’s, or at home. A circular goes out each week with details of the practice plan for those who wish to attend.